Black tea, green tea, oolong tea and white tea are made from the same plant -- Camellia sinensis. Ever since the first infusions of tea about 4700 years ago in China were made, the beneficial effects of tea have been examined. 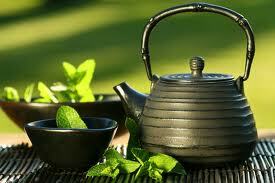 This article will talk about health benefits of tea drinking supported by some studies and also mention drawbacks. 1. It boosts mental alertness and lowers chances of cognitive impairment. Found almost exclusively in the tea plant amino acid L-theanine actively alters the attention networks in the brain by affecting neurotransmitters and increasing alpha brain-wave activity. This results in an alert, but more calm state of mind. Studies of the elderly Japanese people showed that those who consumed more than 2 cups of green tea daily had 50 percent lower chance of having cognitive impairment than those who consumed less. This is due to the presence of antioxidant epigallocatechin gallate (EGCG -- type of catechin) in tea. 2. It lowers stress hormone levels. Researchers at University College London found that drinking black tea after a stressful event lowered levels of the stress hormone cortisol. In this study those subjects who had been drinking 4 cups of black tea daily for 6 weeks had a 20% greater drop in cortisol than the placebo group. 3. It helps to lose weight and lower LDL "bad" cholesterol levels. Studies in Netherlands and Japan showed that green tea does both. Dutch participants who drank caffeinated and decaffeinated varieties of green tea noticed decrease in their waistlines. Japanese men and women who were given green tea extract for three months lost fat and had lower LDL levels. 4. It increases metabolic rate (the amount of daily energy expended by humans and animals at rest). University of Geneva and University of Birmingham conducted clinical trials which indicate that green tea raises metabolic rates, speeds up fat oxidation, improves insulin sensitivity and glucose tolerance. Caffeine and polyphenols in tea raise thermogenesis (the production of heat by the body) and thus increases energy expenditure. 5. It boosts immune system. In 2003 study done by Brigham and Women's Hospital during four-week trial 11 coffee drinkers and 10 tea drinkers consumed 600 ml of coffee or black tea daily. Their blood sample analysis showed that the production of anti-bacterial proteins was up to five times higher in tea-drinkers, which was an indicator of a stronger immune system response. Tea contains theanine which might be responsible for boosting the disease-fighting capacity of gamma delta T-cells thus helping the body's immune response to fight infection. 6. It helps fight fungal and bacterial infections. Pace University conducted a study in which they found that white tea extracts are effective in treating bacterial and fungal infections. Green tea extracts did not show as much effect as white tea. 7. It has antibiotic effects. Catechins in green tea are responsible for disrupting a specific stage of bacterial DNA replication process thus possessing antibiotic properties (citrus such as lemon added to the tea causes more catechins to be absorbed). White and green teas have the highest concentration of catechins. 8. It has anti-cancer properties. Numerous studies suggest that green tea protects against different types of cancers, including breast, lung and prostate cancer. Again antioxidant EGCG is sited as the reason. One Japanese study showed that after drinking two to three cups of green tea growth of human lung cancer cells significantly slowed. Another study claims white tea to be even more effective in battling cancer than green tea. Other benefits of tea include: possible prevention of diabetes, as a complementary therapy for HIV patients in combination with conventional medicines, reduction of the effects of inflammatory bowel disease (IBD), reduction of the growth of bacteria that cause bad breath and other ailments. Consumption of tea also has some drawbacks. The fluoride in tea leaves can increase the risk of osteofluorosis and fractures (applies to high daily fluoride intake of over 2 mg for children and 4 mg for adults). How much fluoride the tea will contain directly depends on the fluoride content of the soil in which it is grown. Due to environmental pollution aluminum can also be found in tea. (Organic soil provides non-chemical nourishment to the tea plants and that is why some people prefer organic teas). Also consider that tea contains caffeine and too much of it can result in harmful side effects, such as certain sleep disorders and diuresis. Decaffeinated varieties of tea, however, contain less catechins (which have antibiotic and antioxidant properties). Because tea contains oxalate overconsumption of it can cause kidney stones. Some studies suggest that tea drinking maybe negatively associated with risk of esophageal cancer due to the chemicals known as tannins (milk binds with tannin making it harmless). Like with anything else in life it is good to maintain balance. Drinking too much tea may be harmful and drinking too little may not be beneficial enough. It is better to drink tea when it is lukewarm or warm temperature -- at least 4 minutes after it has been poured. It is nice to know that when you enjoy your cup of tea you receive health benefits too.